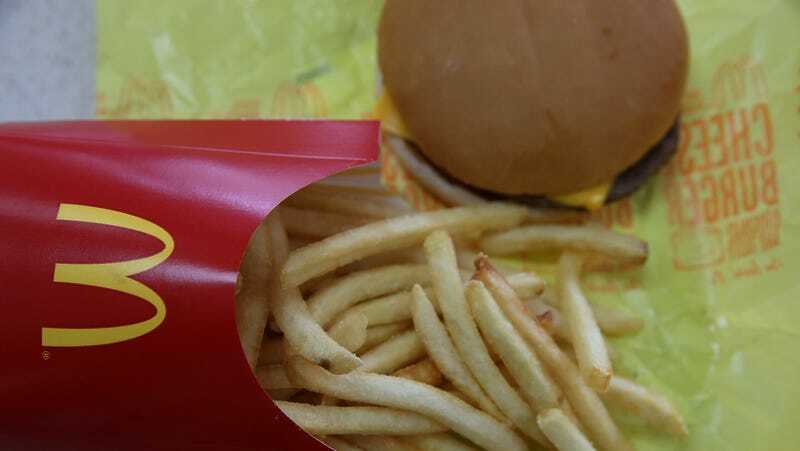 July 10 update: CBC is reporting that the 6-year-old McDonald’s meal has been removed from eBay, because the auction site prohibits selling “unpackaged or expired food.” The Takeout placed a bid for $77 Canadian dollars, but was outbid—it went all the way up to $150. Man, people. So, credit card hot in his hand, our fearless editor-in-chief Kevin Pang bid $77 real Canadian dollars on a decrepit but disconcertingly preserved hockey puck of a burger. The CBC’s story notes there were no bids as of last night; but today, the war is on, with more than 20 current bids. Why are we doing this? I ask you instead: Why the hell not? The Takeout could be that home! The desks at our Chicago offices would be the perfect environment for this adoptable, petrified patty. It’s like a pet rock—but grosser! I’m trying not to get my hopes up too much. After all, the auction still has six days left, and eventually we’re going to get a call from the accounting department about our company card expenses (again), and the desiccated fast-food meal could tragically elude us. Cross your fingers for us, team. * Oops, we’ve already been outbid. Ask The Salty Waitress: Is it rude to ask the server to throw away my trash?